On March 17 of this year it was announced that Fr. Frank Phillips, pastor of St. John Cantius in Chicago and founder and superior of the associated order, the Canons Regular of St. John Cantius, had been removed from public ministry (and thus from his positions as pastor and superior) by Cardinal Blase Cupich, allegedly based on "credible accusations of improper conduct involving adult males." (The more precise nature of these charges as well as the identities of the accusers has never been officially stated or released.) On June 23, after an investigation by the Congregation of the Resurrection ("Resurrectionists") - where Fr. 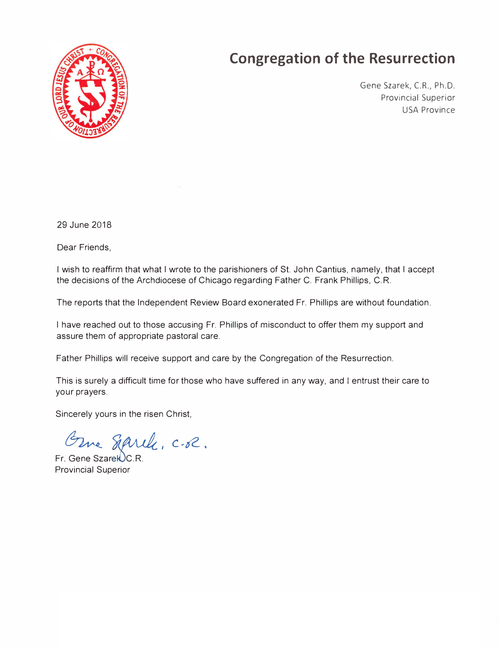 Phillips was ordained and with whom he was also still a member - the archdiocese of Chicago declined to reinstate Fr. Phillips and confirmed that his faculties for ministry would remain withdrawn. 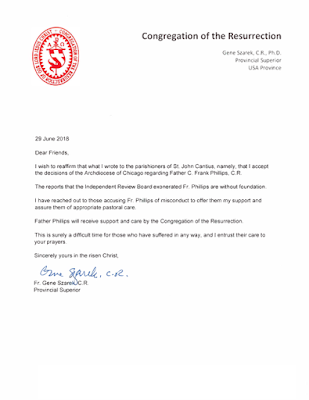 Though neither the investigation report itself nor any other details were publicly released, it is known that part of the recent decision was made against the recommendation of Resurrectionist Provincial Fr. Gene Szarek, based on the report and the results of the investigation. The contents of the report were said to have "exonerated" Fr. Phillips. For recent posts on the story, see here, here, here and here. A source inside the religious hierarchy has confirmed that it was Cardinal Cupich, and not Fr. 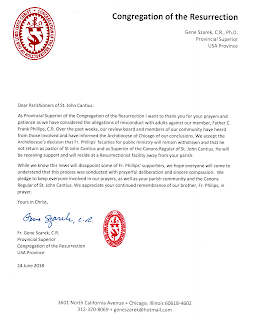 Szarek, who wrote the recent letter to parishioners of St. John Cantius announcing that Fr. Phillips would not be allowed to return to public ministry. Mahound's Paradise has seen documentary evidence establishing the truth of this. The source was careful to use these words, "[the letter] was constructed in concert with Cardinal Cupich" but then added, "Other 'news' on the internet claiming [Fr. Szarek's] authority is 'fake news.'" I think it's fair to say, at least in colloquial words: the Cardinal wrote the letter. This will perhaps not come as a shock to many. But it's another confirmed example of the archdiocese's distinctive (to put it politely) modus operandi in the entire Fr. Phillips affair. The reasons for the recent severe actions against Fr. Phillips - exactly what he was charged with or alleged to have done - have still not been revealed by the archdiocese. And there is no indication that it is currently inclined to ever do so. Some have said that it is up to Fr. Phillips to set the record straight. It is reasonable to expect that he will try to do so. But it's a funny burden of proof. Any general declaration of innocence will still arguably leave a cloud, while any specific statement may have an embarrassing effect - "I DIDN'T beat my wife" or "It's true that I may have beaten my dog but not my wife" - and could still be vulnerable to the charge of not referencing the sinister sounding "other information" hinted at by the archdiocese. Or so the archdiocese obviously believes. It's notable (and logical) that the letter does not deny the claim of the above post. But it does seem to deny the recent reports that Fr. Phillips had been "exonerated" by the review board. But "exonerated" or "not exonerated" from what? I will only suggest that, as has so often been the case in this matter, ambiguity is once again being well made use of. The fact that ++ Cupich is at the helm of this persecution must mean that Fr. Phillips is not a practising homosexual, so whatever the 'other' charges are must be revealed. If this intimidation was at the instigation of ++ Cupich & not verifiable 'other' accusers the parishioners must be informed straightaway. Nope....I'm afraid that will not happen, at least it will be a cold day you know where when it will. + Cupich must think that all of us are just blind sheep listening for the sound of his voice to lead us (into H _ _ _) because he has been pretty much transparent, in spite of his secrecy, in his motives. Only people that are extremely naive and haven't any knowledge of what this guy is all about will dismiss it as a 'nothing burger'. Or they are of like mind. I mean, seriously, does anyone at this point believe the 'good Cardinal' acted out of pure, rightly ordained intentions when it was handled like THIS?? PLEASE! Seriously, how can you give an ounce of credibility to a Cardinal who, in his last Diocese, like a TYRANT locked parishioners out of their Church on Holy Thursday because he didn't want the TLM said? Gave instructions to the faithful NOT TO KNEEL at the Consecration? Or....a Cardinal who celebrates the likes of Fr. James Martin just RECENTLY so much so that he invites him to speak at Holy Name Cathedral during the Lenten Mission? If it walks like a DUCK......and so on. If people don't know the M.O. of this guy by now, who can help them? At this point, the only parties that/who can clear the air about the specific findings are the archdiocese (this is highly unlikely) and Father Phillips himself (this is possible, but as time passes, somewhat unlikely). It seems to me that the only reason is that exposing the truth would be embarrassing for the archdiocese. Since the decision to remove Fr. Philips is controversial, then it would be in the archdiocese's interests (a) to state the alleged misbehavior, unless perhaps it was too trivial to justify removal; and (b) if Fr. Philips was found "guilty" of anything, to explicitly say so. It's reasonable to conclude that the nature of the offenses are being withheld because they are too trivial to warrant the severe punishment given (recall Fr. Szarek recommended sensitivity training, which is a "slap on the wrist," and only recommended against returning as pastor because of age and the cardinal's wishes). It's also reasonable to conclude that if Fr. Philips had been found definitively guilty without mediating circumstances, then the archdiocese would have said so, since that would provide justification for their actions and quiet some of the gossip. Generally when someone is acting in an honest and straightforward way, they don't withhold information or communicate through unwilling third-party mouthpieces. On the other hand, when someone is furtive and vague and refuses to answer simple, reasonable questions, it's reasonable to suspect they are up to something nefarious. 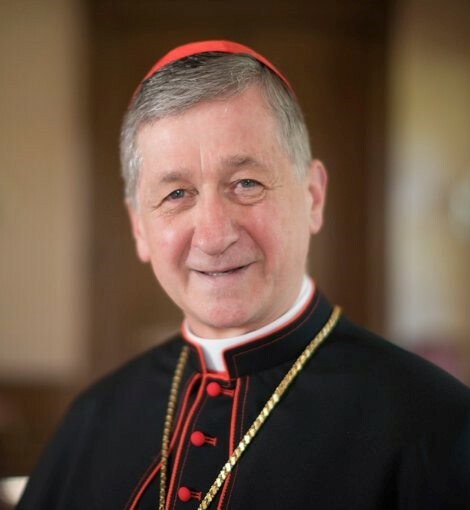 Have there ever been any credible accusations of homosexual behavior leveled at Cupich? Satan reigns in Chicago. Thanks be to God for the SSPX.